Click on the section names to return to the top of the page. The descendant of the Federation of England and Denmark formed in 1816, the Anglo-Danish Empire is a full political union of the two countries formed in 1871. The Federation of England and Denmark was in turn formed out of the Personal Union of the thrones of England and Denmark formed in 1785 after King Christian VII of Denmark died without issue. The union of the absolute, if enlightened, monarchy of Denmark with the parliamentary system of England, the Anglo-Danish Empire also includes Norway, Iceland, Greenland, Heligoland and various colonial possessions around the world. The Anglo-Danish Empire does not include Scotland or the Rock of Gibraltar. Britain lost the former to secession during the War of the English Succession and the latter back to Spain in 1744, during the same war. The Anglo-Danish Empire is, with the Kingdom of France and the Sarajevo Pact, one of the three foremost industrial powers of Europe (not including the Holy Russian Empire), in particular when the contribution of its colonial empire is included. However, it is weaker than the British Empire of the real world because it lacks the income the real-world British Empire had from India. The Anglo-Danish Empire is a representative democracy, in which members of parliament from all of the regions of England and Denmark (including Norway and Iceland) are elected by the people and legislate from the Houses of Parliament in Copenhagen and London, between which the Parliament alternates on an annual basis. Parliament is divided into a House of Commons and a House of Notables [equivalent to the House of Lords of the real world]. The Empire has universal suffrage for all citizens over the age of twenty-one. However, the monarch, currently King Albert I of the House of Oldenburg, retains a good deal of power and is definitely more than simply a figurehead. When in England the monarch resides in and rules from the Palace of Whitehall, which in this world did not burn down in 1698. The head of the Anglo-Danish government is known as the Grand Chancellor, a title adopted from the Danish government [with a very different political history to Britain in the real world there is no title of Prime Minister]. The Grand Chancellor is head of the cabinet and usually also leader of the political party that is currently in power. The Grand Chancellor lives in the House at the Back, which lies adjacent to the Palace of Whitehall [in the real world the House at the Back forms part of 10 Downing Street]. Also, the Anglo-Danish government does not simply respond to the needs of the people, it also responds to the wishes of the three great companies who are based in the country - the Royal Universal Company, the Muscovy Company and the Hudson's Bay Company - as well, who are known as the Great Three. Given their power, wealth and influence, the great companies have more influence on the government than the common mass of the people as a whole. This is partly due to their contribution to the financing of the nation, and also because they often offer directorships to government officials when they leave government service, largely quashing any motivation to change the system. Because of this the Anglo-Danish government is, in general, highly motivated to keep the great companies happy and on their side. Although the occasional rabble-rousers try to eliminate this corruption from government, the general mass of ministers and so on are happy enough with the system as it stands that things do not change. The great companies are generally sensible enough to keep the mass of people happy, and not be too blatantly exploitative, so that so far the system works. Many companies contribute towards charitable works, in particular hospitals, schools and universities, and fund promising students to university, in part to keep the people happy but also because by doing so they can benefit themselves. Their contributions fund most of these facilities in the Empire. However, as a consequence of this there is very little welfare state provision for people, with most health and other care for the poor being via private medical insurance (which does affordably exist even for the poor, if it a minimal level) and charity, with the workhouse system continuing to provide a very minimal safety net for those with nowhere further to fall. Because of the influence of the Great Three the Anglo-Danish Empire its government is in reality a form of Corporatocracy rather than a true representative democracy, in that the government is not actually by a corporation, but that instead the government has little choice but to bow to pressure from the corporate entities of the Empire, in particular the Royal Universal Company, the Muscovy Company and the Hudson's Bay Company. Because of this the Anglo-Danish Empire has very little that resembles the Office of Fair Trading of the real world, and only minimal environmental legislation so that there are significant amounts of pollution in parts of the empire. Another effect of this means that there are no national parks in the empire. The colonies of the Anglo-Danish Empire are run as Dominions rather than being considered parts of the home country. As such they are each run by an autocratic President appointed by the government who rules the Dominion, aided by an Advisory Council made up of representatives of all of the provinces within that Dominion. [Note that the term Dominion does not have the generally-accepted sense of the word that it does in the real world. The Dominions do not have the independence from England that the later British dominions in the real world were given.] Because of unrest in the nineteenth century and regions of Ireland, Wales, Norway and Iceland are also run as Dominions within the Empire. Although a member of the One Truth bloc, the Anglo-Danish Empire has two state religions, Anglicanism from the English and Lutheranism (which is a different branch of Protestantism) from Denmark, as well as a tolerance for a third, Catholicism, particularly in Ireland, Maryland and Cuba in the Dominion of New England and the Dominion of Mosquitia. All of these are covered by the brief of the Ministry of Ecclesiastical Affairs. This makes the Anglo-Danish Empire quite out of the ordinary as far as One Truth nations in general go. Unlike the case in the real world, here a genuine, long-running and armed animosity continues to exist between the people and government of England-Denmark (and by extension the rest of the Empire) and France. This arises because in this world France has remained a colonial and naval power, and therefore the principal European rival to the Anglo-Danish Empire. THE PRESERVATIONIST PARTY. A descendant of the Tory party, they wish to preserve the nation from bad influences of all kinds and preserve the best of the past, while also allowing progress into the future. It is one of the three most powerful political parties in the Empire. THE PROGRESSIVE PARTY. A descendant of the Whig party, they are more progressive and wish to do what they consider to be best for the country, even if that means elements of the past must be swept aside to allow this. It is one of the three most powerful political parties in the Empire. THE EGALITARIAN PARTY. A party that espouses their Egalitarian doctrine that people should be treated as equals, and that the wealth of the nation should be used to best achieve this end. As such it is a form of socialist labour party. It is one of the three most powerful political parties in the Empire. THE REFORM PARTY. A group who wish to turn the Empire into a true democracy and limit the powers of the Great Three. It has a good deal of support by the people, but strangely its policies never seem to succeed in Parliament. THE CROWN PARTY. A party which wishes the Empire to go back to an absolute monarchy. THE ENGLISH INDEPENDENCE PARTY. A party whose aims are given by its name. They are very much a fringe party. THE DANISH INDEPENDENCE PARTY. A party whose aims are given by its name. They too are very much a fringe party. THE UNITED KINGDOM PARTY. 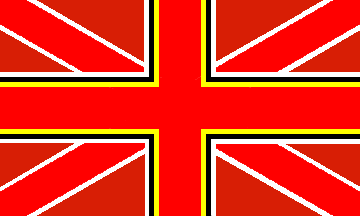 Who support the reunification of England and Scotland, by force if necessary. Again, they are very much a fringe party. THE ROYAL UNIVERSAL COMPANY. The successor to the British East India Company, the Anglo-Danish Royal Universal Company is a major economic and political power in the Anglo-Danish Empire, and has been for a long time. It has interests in most areas of the economy, including significant parts of the commercial and retail markets in England and Denmark themselves and their colonies, and vast wealth. The company is not as powerful as the government but can significantly influence the government if it wishes to (which it sometimes does). It is a significant factor in the everyday lives of the average citizens of the Anglo-Danish Empire, and also of the nations with which the company trades, which includes most of the nations of the world. The Board of Directors of the Royal Universal Company, based in Universal House (the former East India House), are often referred to as the 'Second House of Notables' due to their power and influence. THE MUSCOVY COMPANY. A company mainly concerned with trade with the Holy Russian Empire via eastern Europe, it has been in existence since 1555. Over time it has gained a great deal of trading power in England and Russia, and also in other parts of the world where the influence of the Holy Russian Empire is strong. In addition to trading with the Holy Russian Empire via St Petersburg, during the Long War it also developed significant port facilities at Archangel, as this port can be reached without having to run the gauntlet of the Baltic Sea, which is bordered by the Sarajevo Pact. The Muscovy Company has its headquarters in London and Moscow. THE HUDSON'S BAY COMPANY. A company largely devoted to trade within the north of North America, it also conducts a good deal of trade with the Alyeskan part of the Holy Russian Empire. The Hudson's Bay Company has its headquarters in Godthåb in Greenland, the capital of the Dominion of Nordland. The Great Three each have their own police, military and intelligence services. The majority of these services operate in the regions they control, but elements of them do operate in the core, non-colonial, areas of the Anglo-Danish Empire. There are two joint first languages in the Anglo-Danish Empire, English and Danish, both of which have converged over the years so that by the present day each has large numbers of loan words and ideas from the other. There are also a wide variety of dialects of both languages deriving from different parts of the Empire. Welsh and Irish are also spoken by many of the people of those nationalities. There have been two attempts to introduce a new single official language formed from a merging of Danish and English, but these both failed due to resistance to the idea in the general populace. This combined Danish/English language is derisively known as Danglish or Engnish. The flag of the Anglo-Danish Empire combines the flags of England and Denmark, with a red cross of St George bordered by the black and yellow of St David (for Wales), and a red saltire of St Patrick (for Ireland). All of these are bordered in white, for the white background of the flags of St George and St Patrick, and also for the white cross of the Dannebrog, the old Danish flag. 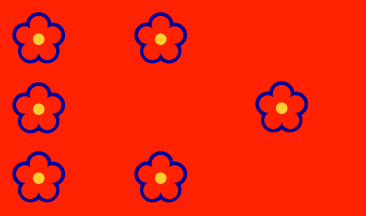 All of these are on a dark red background whose colour is derived from that of the field of the Dannebrog. The currency of the Anglo-Danish Empire is the Pound/Rigsdaler, which is divided into twenty Skilling/Shilling, which are each divided into twelve pennies/pfennig. The Anglo-Danish Empire uses the Julian calendar, which England has never changed from, and to which Denmark reverted (under protest) from the more accurate Gregorian calendar in 1786. A German Kingdom in central Europe, founded in 1898 when all of the smaller states in the Germanic Alliance, founded by Bavaria as a defence against Prussia, merged with Bavaria in 1898. A second-rank industrial and military power, Bavaria is ruled by the Kings of the Münchener dynasty, also founded in 1898 with the renaming of the ruling dynasty of Bavarian prince electors. They have remained fairly prosperous by being neutral in the Long War, although happy to talk and sell to anyone, and with more ties to the Dharmic than the One Truth blocs, and in particular to the Sarajevo Pact. 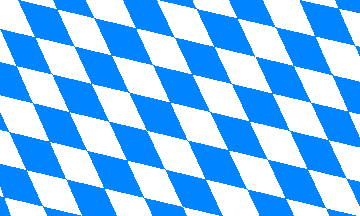 The flag of the Kingdom of Bavaria is based on the traditional flag of the former Duchy of Bavaria, consisting of a number of alternating blue and white lozenges (diamond shapes). A founding member of the Sarajevo Pact, Bulgaria was effectively taken over by the Holy Russian Empire in 1839, although it retains a nominal independence as an ally of Russia. The Bulgarian head of state is the Hadjuk, of the Romanov dynasty, having been joined to the Russian Romanov dynasty by marriage in 1844. He rules the country as a Russian puppet from the capital city of Sophia. Bulgaria as whole is a very strict military/religious dictatorship, much like the Holy Russian Empire itself. Since the official absorption of the Bulgarian Orthodox Church into the Russian Orthodox Church in 1839, there has been no Patriarch of the Bulgarian Orthodox Church in Bulgaria itself, and the official Bulgarian Orthodox Church has been subsumed into the Russian Orthodox Church. However, the Bulgarian Orthodox Church is very much alive in Bulgaria, but underground, and there is a Patriarch of the Bulgarian Orthodox Church who lived in Istanbul as a guest of the Patriarch of Constantinople until its takeover by the Holy Russian Empire in 1864, when he was forced to relocate to Jerusalem. Despite the best efforts of the Russians to Russ-ify the country, including the suppression of Bulgarian Cyrillic script in favour of the Russian version, and the compulsory teaching of Russian language and culture, Bulgarian culture, like its church, remains alive but hidden from the authorities. The restoration of the Bulgarian Orthodox Church and Bulgarian culture generally remains the rock upon which many of the large number of Bulgarian independence movements build their support. As in the Holy Russian Empire there are large no-mans-lands along the Bulgarian side of all of its land borders. This is to allow a massively strong border defence, and also to prevent the other nations building visual propaganda displays that might corrupt Bulgarian citizens if they were to see them. Bulgaria also has a number of large naval bases along its coast with the Black Sea, as well as ports through which in conducts all of its official trade, exclusively with the Holy Russian Empire. Bulgaria maintains a massive military, much of which is dedicated to internal security, with many of the rest dedicated to intelligence gathering from the rest of Europe. There are many surveillance and intelligence centres spread across the country. There has been a good deal of Russia immigration to Bulgaria over the years, used to cement Russian control of the country. This causes a good deal of friction with the native population. Because of its position and political links to Russia Bulgaria is sometimes referred to as 'Little Russia'. In more heated speeches by those who oppose it, it is referred to as a 'bleeding sore in the flank of Europe'. Bulgaria, like the Holy Russian Empire, was badly damaged in the Long War. Unlike Russia it has recovered from the war much less, due to Russian concentration on rebuilding Russia itself. Maintaining its massive military in particular is hindering its recovery, but the government does not dare do otherwise for fear of the consequences. Because of this its neighbours in the Sarajevo Pact, who do not wish to fight a war over the matter as they are still recovering themselves, consider it only a matter of time before Bulgaria collapses, allowing a more friendly government to be installed. A constitutional monarchy, France is governed by the Estates-Universel, a parliament with representation from all levels of society and all parts of France and the French Empire which runs the country from the former Royal Palace of Versailles. It has done this since the end of the Second French Revolution in 1825. The French monarchy is of the Restored Bourbon Dynasty, with the King acting as head of state though without possessing any real power. Elections to the national Estates-Universel are held every six years, with elections to the local Estates-Universel that run the regions of France held at the same time. There are no political parties as such in France; instead a wide variety of special interest groups perform a similar function. Above the national Estates-Universel is the Conseil d'État (Council of State), which forms the French Cabinet. Its members are selected from the national Estates-Universel. The French head of state is the Chef d'État (French for 'Head of State') who, like the government in general, resides in the Palace of Versailles. Since the Second French Revolution the Kingdom of France is one of the minority of nations in the world to separate church and state, though it not a member of the Vrijdenkerij (Freethinker) movement. All of the colonies of France, as well-established territories in their own right, are part of what is known as France-Outre-Mer. They are considered to be administratively part of France, with the same status as territories in European France itself, and representatives in the Estates-Universel. In addition to its extensive colonial Empire, France also has control of the island of Malta in the Mediterranean Sea, and has leased part of the surface of the Moon from the Mughal Empire and Dakshina Nad. France is, with the Anglo-Danish Empire and the Sarajevo Pact, one of the three foremost industrial powers of Europe (not including the Holy Russian Empire), in particular when the contribution of its colonial empire is included. Unlike the case in the real world, here a genuine, long-running and armed animosity continues to exist between the people and government of France and England-Denmark (and by extension the rest of the Anglo-Danish Empire). This arises because in this world France has remained a colonial and naval power, and therefore the principal European rival to the Anglo-Danish Empire. The animosity between the two nations was not helped by the events of the Long War, and the French invasion and takeover of the Îles de la Manche [the Channel Islands] in 1958, which they control to this day. Although initially hostile to one another, over the years the shared culture and a lack of competing national interests (arising from their large geographical separation) has led to increasingly good relations between the Kingdoms of France and Canada-Louisiana, although there is no danger of the two nations ever merging back into one. There is no formal alliance between the two nations, but relations are nonetheless close. Many French cities were damaged or destroyed during the Second French Revolution, in particular Paris. These were rebuilt once the new regime stabilised, with the rebuilding being a mixture of what were then the most modern ideas and techniques, combined with the need for economy in many areas. There is a significant minority of Scottish-descended people in France, who emigrated there during or after the War of the English Succession. During the period between the First and Second French Revolutions, when France was run by Le Dictateur, the flag of France was a modified version of the Oriflamme of Charlemagne. 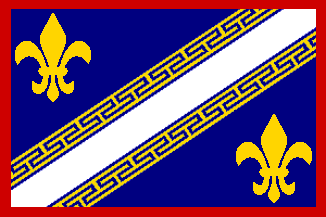 The flag of France under the Estates-Universel is based on the flag of Reims, where the Estates-Universel movement began, with additional fleur de lys to indicate the monarchy, and a red border to indicate the blood shed during the two French Revolutions. The currency of the Kingdom of France is the Livre, with other units of currency being derived from it. These consist of the Louis d'Or, which is four Ecus or 24 Livres or 480 Sols or 1960 Liard or 5880 Denier. Note that although they have the same names these do not have the same value as those used in Canada-Louisiana when compared with the other currencies of the world. The Holy Russian Empire, stretching from the Baltic Sea in the west to Hudson's Bay in the East, is the largest single nation on Earth in terms of land area. It is the Empire upon which the Sun never sets. Since the Russian Revolution of 1759 the Russian Empire has been a theocracy run by the Russian Orthodox Church, with the Tsar a figurehead. The driving force behind the Russian Revolution was the revelation that the reforms of the Patriarch Nikon, made in 1653, were as invalid as those who had resisted them from the start had claimed. Attempts by the Russian government to suppress those who still followed the old ways, known as Raskolniki (Schismatics) only increased their support until they overthrew the old regime and installed a new one. Because of its origin in the Raskolniki, the official Russian Orthodox Church follows what is known in the real world as the Old Believers faith, rather than 'mainstream' Russian Orthodoxy. Because the Mughal Empire has hindered the expansion of Russia to the south, many of the Central Asian khanates remain as independent nations, and Russian has instead expanded to and focussed on the east. Over time is has acquired Mongolia, parts of northern China, Japan and Korea, as well as taken large parts of northern North America, so that it has complete control of the North Pacific. In addition it has taken control of the islands of Hawaii, and these form the southernmost part of the Holy Russian Empire. The long-term threat of the Mughal Empire to their south, and that of many of the other nations of Europe to their west has led to the Holy Russian Empire having long been more militaristic than the Russia of the real world. The official capital of the Holy Russian Empire is the city of Moscow. However, the administrative capital of the Empire is at the most important Russian monastery and the spiritual centre of the Russian Orthodox Church, the Trinity Lavra of St. Sergius in the city of Sergiyev Posad, located some ninety kilometres to the north-east of Moscow on the road to Yaroslavl. Because of its importance to the Holy Russian Empire Sergiyev Posad is a large, if entirely non-industrial city, and very well served by transportation links. The Tsar, currently Ivan VIII, rules the Holy Russian Empire in name only, from his palace in the Moscow Kremlin. There have been no Tsars named Alexis since the Russian Revolution, as that is the name of the Tsar who approved the Nikonian reforms that led to the Raskol, and so the Russian Revolution. The monasteries of the Russian Orthodox Church are the administrative centres of the Holy Russian Empire. All of these are fortified in case of civil and other unrest (though little of this occurs since the end of the Long War), and many of them either contain or are entirely barracks for the white-uniformed soldier-monks who form the Russian military. Despite technically being monks, in practical terms (such as behaviour) they differ little from the soldiers of other nations. Over the years the term Kremlin has come to expand from meaning simply a fortress to instead meaning any Russian government and/or church facility; though these are all fortified to some extent, to keep the general run of the population out. Many of the Kremlins of Russia have expanded over the years so that they are, particularly in places like Moscow, effectively small closed cities within the larger city, walled off from the general population with quite large populations in their own right. All train stations are either within the Kremlins or have their own Kremlins. Many factories are attached to Kremlins, but not part of them directly, so common workers can come in and work without having to enter the Kremlin proper. All architecture in the Holy Russian Empire remains locked in the old styles approved by the Raskolniki Russian Orthodox Church. Modern materials are discretely used only for strength, and only for the glory of God, by producing cathedrals larger and taller than traditional materials would allow. The only high-technology buildings in the Holy Russian Empire are found in the Kremlins of the Russian Orthodox Church that exist in all towns and cities. Even so, no buildings of any kind are allowed to be higher than the roof of the local cathedral(s), as they do not wish to overtop the works of God with the works of man. Many of the cities of the Holy Russian Empire still show signs of damage from the bombardment they suffered during the final phases of the Long War. There is rebuilding taking place but in many cities this has not yet completely covered the scars of the war. Outside the cities these bombardments had little effect on the general populace of Russia as almost everything is done and produced at a local level, so only immediate damage was relevant to most people. Some cities, like St Petersburg, that were considered particularly contaminated by ungodliness, were demolished and rebuilt during the early days of the Holy Russian Empire, leaving them much more like the old Russian cities. The more restive parts of the Holy Russian Empire are under direct military governorship than being run through the Russian Orthodox Church. These include Yapon [Japan], Joseon [Korea], Mongolia, some border regions, and regions containing exile camps, such as parts of Alyeska [Alaska]. There are large no-mans-lands along the Russian side of all of its land borders with Europe and the other advanced nations. This is to allow border defence, and also to prevent the other nations building visual propaganda displays that might corrupt Russian citizens if they were to see them. In Central Asia, where the borders are much longer and, unavoidably, much more porous, patrol and surveillance aircraft, mainly unmanned solar-powered airships, monitor the border to ensure that a little cross-border traffic as possible occurs. The Holy Russian Empire is a state which is quite odd. In many areas it clings to the past, particularly in terms of farming, peasant life and so on. In others, such as the military, it is ultra-modern. It is thus a nation of contrasts. The vast majority of the population live at a level that has not changed a great deal in centuries, in small cottages, with no electricity or running water and no advanced technology. However, they may use high technology in their work, either on the land or in factories or for the government. And the military has the finest high technology the Empire can provide. Public buildings are also built with high technology, so that many cities have a centre consisting of modern buildings in the midst of a sea of cottages, with advanced electric trains running next to roads of dirt and mud. The need for industrialisation in the Holy Russian Empire after the War of the Russian Humiliation led to elements of the agricultural revolutions taking place elsewhere in the world being adopted in Russia. This, combined with the lack of Serfdom in the Holy Russian Empire, provided the mobility of labour and freed up people from the land to go and work in the new industries that were established at a much earlier time than was the case in Russia in the real world, as well as to build the network of railway/telegraph highways that now link the various regions of the Holy Russian Empire. The Holy Russian Empire differs greatly from the rest of the world in using an eight foot railway gauge dramatically larger than those used in any other nation. Thus their rail network is almost completely incompatible with that of the rest of the world, but its vast trains, mostly running on concrete rails, allow long journeys across the vastness of Russia without refuelling. Needless to say, despite the best efforts of the government there is an illegal creep of technology from those areas where it is permitted (those to do with the government and preservation of the Holy Russian Empire) to those where it is not (the normal lives of the people), often associated with the smuggling of technology into the Empire from outside. And it is very much an open secret that the rulers of the Empire live in splendour with all of the high technology they wish. Those who have served the Empire in posts abroad often bring back tales of the technological wonders freely available there, increasing unrest in the Empire, although the Russian Orthodox Church condemns such things as the works of the Devil. Because of this, and because of the deep-seated loyalty to and indoctrination by the Holy Russian Empire there is little defection from it. But tensions are growing, even with the new, more liberal government that took power at the end of the Long War. Entertainments in the Holy Russian Empire are also, in general, on a local level. Drinking is always popular, as are wrestling, dancing bears, board games and so on, all of an appropriate level of technology. There are a number of factions among the Raskolnik government of the Holy Russian Empire. First, there are differences over the issue of technology. Some, the minority Idealists, wish to eliminate all advanced technology from the Holy Russian Empire; even they disagree over precisely where the elimination of technology should stop, although most consider at a biblical level to be acceptable. The majority are Pragmatists, willing to accept enough technology to protect the Empire and no more. The minority Progressives wish to remove all limitations on technology and have the Empire advance as much as the other nations of the world. They have gained significant support for their agenda since the end of the Long War, though they still disagree over the ideal distribution of technology. In addition to this there are splits over how the Holy Russian Empire should interact with the rest of the world, though this is more of a spectrum of opinion. This varies from complete isolation from its corrupting and damaging influences to those who wish to evangelise Russian Orthodoxy to the world at all costs. Since the Long War the Isolationists have gained the upper hand over the Evangelists who dragged the war out for so long. The Russian government contains individuals from all combinations of these opinions, though Pragmatic Isolationists currently have the upper hand in government, having taken over from the Pragmatic Evangelists at the end of the Long War. The population of the Holy Russian Empire is greater than of Russia in the real world, at some half a billion people. This is partly because of the larger populations it includes in its Asian territories, including Chinese, Yaponese [Japanese] and Joseonese [Korean]. The Holy Russian Empire is the heart of the One Truth bloc, and has long funded pro-One Truth groups and Russian Orthodox Missionaries around the world. This activity has slowed but not ceased under the post-Long War regime. 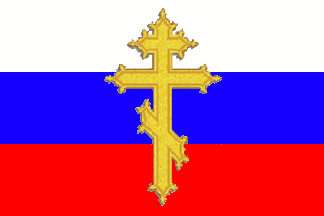 The flag of the Holy Russian Empire is the traditional red, white and blue tricolour of Russia, overlaid with a golden Slavonic Cross, a symbol found widely across the Holy Russian Empire, and particularly used in the Russian Orthodox Church, being the Eastern Orthodox version of the Christian cross. The currency of the Holy Russian Empire is the Rouble, which is divided into one hundred kopeks. The Holy Russian Empire uses the traditional Russian system of weights and measures. Because of the past-looking viewpoint of the Raskolniki government, beards are mandatory for men and Russians of both sexes adhere to old-style Russian dress, with male and female attire differing mainly in the details of cut and decoration. In cold weather a myatel, a type of combined cloak and jacket, is worn over all of this. Over the myatel is worn the korzno, a fur-lined cloak of heavy cloth. In formal situations a highly embroidered collar, the ozherel'e, is attached to the rubakha or caftan. For ceremonial occasions a loose long-sleeved fur-lined tunic, the feryaz, is worn over the rubakha (for merchants) or caftan (for people of higher rank). The nobility also sometimes wear a winter or summer shuba, a long, wide long-sleeved coat of decorated or patterned material that is put on over the head, with a high standing collar. They may also wear a fur-lined and expensive sheepskin or leather jacket, the kozhukh. Both sexes wear any of a variety of hats, normally of felt, wool or fur. These can be caps, skullcaps, or pointed or cylindrical hats. Most have ear flaps. Young girls and unmarried women wear their hair loose or plaited into a braid and held back with a band, to which is sewn a kosnik, a solid triangle of leather or birch-bark. Married women cover their hair with a podbrusnik, a hat made from thin material, or a volosnik, a net made of silk, silver and/or gold strands. The state religion of the Holy Russian Empire, the Russian Orthodox Church adheres to the practises used before the reforms of the Patriarch Nikon, made in 1653 and reversed in 1770. These are the practises of what are known in the real world as the Old Believers. Even more than the Russian language, it was considered a vital constituent of the Russian nation, and as such is heavily promoted by the government. The church is led by the Patriarch of Moscow, Constantinople, All Russia and All Bulgaria, currently Ignati Sadkovitch Roskov. The Patriarch became the Patriarch of Constantinople after the Russian takeover Anatolia in 1873, which gave them control of the Orthodox Church of Constantinople and so the Patriarch of Constantinople, who 'freely' merged his church with the Russian Orthodox Church. Of course, true followers of the Orthodox Church of Constantinople dispute this, and remain active elsewhere. Likewise, the Bulgarian Orthodox Church merged with the Russian Orthodox Church after the Russian takeover of Bulgaria in 1839. The 'White Clergy', urban priests who work among non-Church people. Many of these are rich and respected members of the community. It is members of this branch of the church who are responsible for the running of the Holy Russian Empire and teaching the children of the Empire. All members of the military of the Holy Russian Empire are also part of the White Clergy. As such all of its personnel are technically monks, although in practical terms (such as behaviour) they differ little from the soldiers of other nations. Members of this branch wear white uniforms, apart from (for example) in combat, where pragmatism requires that something else, such as camouflage, be worn. The 'Black Clergy' who make up the monks and nuns of the Church, having given their lives and property over to it. Members of this branch wear black uniforms. Some monasteries ostensibly of the Black Clergy are actually places of discreet exile for those too important or high-ranking to be sent into the common Katorga system. The Black Clergy also includes the scientists and technologists of the Empire. As part of its belief in the equality of all men under God, the Holy Russian Empire is a fairly egalitarian society, with anyone of any race and social class who has the ability having, at least nominally, the chance to rise to the highest levels through their own efforts. Everyone is considered to begin life with as much potential to rise before God as any other. At least if one is a man. Serfdom and feudalism were eliminated from Russian soon after the Revolution. Women remain second-class citizens though. In reality, there is still a 'nobility' in the Holy Russian Empire where those in power pass it on to their 'obviously' worthy children. The Holy Russian Empire is also strongly theocratic-nationalistic, in that they believe all Eastern Orthodox believers should be unified into a single state under the Russian Orthodox Church, after which all others should be converted to the One True Way of Russian Orthodoxy. However, these policies have been greatly toned down since the end of the Long War. For those nations taken over by the Holy Russian Empire before this liberalising of policy, such as Yapon [Japan] and Joseon [Korea], their national cultures and identities now only exist underground or in exile. Those who object to this system will find themselves entering the Katorga system of penal servitude which is used to deal with political and religious dissidents of all kinds. All of the ethnic minorities within the Holy Russian Empire, including the Eskimos, Inuit and so on, have also been converted to Russian Orthodoxy, at least officially. As part of this, and to help wipe out their pagan beliefs, the Holy Russian Empire has, in the past, split up families, and had children raised by foster parents or the state to ensure they are brought up in the One True Way of the Church. Officially the Holy Russian Empire contains nothing but Russian Orthodox Christians. In reality numerous people (for example of Jewish or Muslim descent) secretly cling to their old beliefs. From time to time these 'heretics' are discovered and harshly punished. The Russian Orthodox Church as it stands in this world idealises and desires to protect all things old, while also hating the new and innovative. Because of this the Church feels itself entirely justified in keeping technology out of the hands of the populace as they feel it is very ungodly. However, the Church has been forced by events and pragmatism to shift away from this 'pure' Old Belief in order that the Empire might survive. In particular the pragmatic realisation that some things new must be accepted in order to protect the old and allow the Holy Russian Empire to continue to exist has driven a programme of modernisation. Those of the Church make the sacrifice of using these things so that they may protect the general run of the populace allow them to have a godly life, even if they themselves are somewhat tainted by these ungodly things, if under the protection of God. The Russian Orthodox Church also forbids smoking. In the Holy Russian Empire science and technology are referred to as the 'Tools of God', which have been revealed to mankind to allow it to do the work of God. Thus it can only be used with the approval of the Russian Orthodox Church, for Godly tasks. The use of science and technology for anything else is doing the work of the Devil, and anyone doing so will be suitably punished for it. This is one of the means by which the Russian Orthodox Church maintains Russian society in the form that they consider to be best for its people. As a side effect of this most Russians still believe that non-Russians are servants of the Devil because of the way they live and things they use. Part of the Raskolnik movement has been the development of a volunteer army to defend the Russian Orthodox Church and the Holy Russian Empire against those, like the reviled Patriarch Nikon, who would corrupt or destroy it. Because of that the Holy Russian Empire had one of the earliest volunteer citizen armies of any nation in the world and volunteering for the Holy Russian Army is still considered to be an honourable profession in the Holy Russian Empire. Some old soldiers and others in the Holy Russian Empire have trophies consisting of 'Devils Items' taken from the enemy during the Long War. Most do not know what they are, but do know they are evil. In more cases they are kept in churches as items of the Devil's work to be avoided and shunned. Another important feature of the Raskolniki Russian Orthodox Church is the acceptance of martyrdom in the name of the faith as the only way towards salvation. First arising in 1782, during the War of the Russian Humiliation, suicide tactics are now quite widely used by the Russian military, particularly in the form of manned missiles and torpedoes known as Oryzhiya Mychenichestva [Martyrdom Weapons]. Russian soldiers are not expected to throw their lives away lightly, but to do so without question if and when required. Because all Orthodox Christians are expected to participate in at least some monastic works, in response to the commandment of Christ to 'come, take up the cross, and follow me' [Mark 10:21 and elsewhere], the Holy Russian Empire practises a form of National Service in which all males enter the church for a period of two years as they reach adulthood at age sixteen. This service is always in the White Clergy, after which most citizens return to civilian life, though some remain in the church for life and some transfer to the Black Clergy. The Russian Orthodox Church also controls labour within the Holy Russian Empire, as local churches provide the basis around which the workers are organised. Science and scientific research are not encouraged in the Holy Russian Empire and its allies. However, it was realised very quickly during the War of the Russian Humiliation in the late eighteenth century that some science and technology was required for the protection of the Empire. Thus a small research community was set up, dedicated to research useful for the defence of the Empire. Larger than this was the Holy Russian Espionage Office, set up to simply steal and/or reverse engineer science and technology produced by others. Quite early on in their programme to modernise their military, the Russian government realised that having people with scientific and technical knowledge coming back into the community at large was affecting the community at large, making them more aware of technology, making them want that technology. To avoid this, male children (and only male, due to the sexism of the Russian system) who show exceptional intelligence in school are taken off and educated in specialised technical monasteries, which form what are effectively isolated universities/research laboratories, with a religious covering under the aegis of the Black Clergy. This is considered a great honour, and families of such children are rewarded by the state. The scientists, engineers and so who result from this process are put together in these technical monasteries to work, with only the designs of their products leaving them, apart from occasional rare debugging missions and similar tasks. They are allowed to communicate with their families, but this is strictly controlled and censored. The technical monasteries also have a support staff who are also kept separate from the rest of Russian society and who keep things running. The members of the technical monasteries are allowed concessions and eccentricities forbidden to the general run of monks and society, but these are tolerated in order to gain the benefits of their brains. Given the concessions that are often made to them to keep them working productively, the members of the technical monasteries are often mockingly referred to as the 'Grey Clergy'. Some Technical Monasteries are situated adjacent to but separate from towns, in order to give them a supply of manpower. Because of the nature of the Technical Monasteries, mass production of the designs that emerge from them is done in such a was as to ensure that the factory workers building them remain ignorant of what they are making and how it works. As such all industry is attached to monasteries of the Russian Orthodox Church, forming state-run enterprises known as Industrial Monasteries. Those few who do come to know too much often end up in the technical monasteries as assistants and support staff. As with many Technical Monasteries, most Industrial Monasteries are situated adjacent to but separate from towns, in order to give them a supply of manpower. Part of the White Clergy, the Office of Assessment was set up in 1792 to assess technology, whether it is allowable in the Holy Russian Empire, and if so where, whether everywhere, only in the government, or only in the military. Based on their assessment, computers, for example, are usable in the military and in certain areas of government, but certainly not anywhere else. In addition to its assessment work, it also includes an enforcement arm to ensure its decrees are obeyed. As the political currents of the Holy Russian Empire have shifted, the Office of Assessment has varied in its power and influence, from corrupt and weak to being the power in the Holy Russian Empire. In the former case people could often get away with having forbidden items but being discreet about it. In the latter not even the highest in the land were safe. During the Long War, with the troubles then, there was a good deal of smuggling and black market activity, and the Office was weak because all of the best people were off fighting the war. This led to all kinds of problems so that now, with the Long War over and a new regime in place, the Office has becomes stronger and less corrupt again, with a more traditional, 'proper' lifestyle being enforced for the entire population of the Holy Russian Empire. Part of the White Clergy, the Office of Contemplation was set up in the 1770s, not long after the Russian Revolution, to monitor the people of the Holy Russian Empire and weed out disloyalty and unbelief. As such they perform internal security and counter-intelligence duties within the Empire. Because of the nature of their respective duties they are closely linked to the Office of Assessment. Because of their covert nature the Office of Contemplation is in general hidden within the Technical Monastery system. It is rumoured that a number of Technical Monasteries of the Empire are in reality entirely run by the Office of Contemplation. These monasteries have come to be referred to as the Nezrimie Skit [Invisible Monasteries]. As the political currents of the Holy Russian Empire have shifted, the Office of Contemplation has varied in its power and influence, from corrupt and weak to being the power in the Holy Russian Empire. Part of the White Clergy, the Office of Perception was founded in 1790, after the War of the Russian Humiliation, to monitor the world outside the Holy Russian Empire for threats to it, and to act to reduce and eliminate those threats. As such they are the main intelligence agency of the Holy Russian Empire. Because of their wide remit, in addition to and as part of their other duties the Office of Perception performs scientific, technical and industrial espionage around the world. Like the Office of Contemplation it is rumoured that the Office of Perception is mainly based in and run from the Nezrimie Skit [Invisible Monasteries]. Because of the constant perceived threats to the Holy Russian Empire the Office of Perception has always been well-funded and a power in the Holy Russian Empire. A nation formed in 1808 from the Italian states of northern Italy by a combination of diplomacy and force on the part of the Duchy of Milan, as a response to the religious violence of the period and the growth in power of the Kingdom of Naples to the south. The Kingdom of Milan in a federation of the states from which it is formed, whose representatives meet at the Milanese Parliament in Milan. Its head of state is a monarch of the Habsburg dynasty. As well as its North African colony of Tunis, it includes Rome and the former Papal States as part of its territory. Thus the representative of the Pope is one of the representatives who meet in Milan. A Kingdom covering the southern part of Italy and the island of Sicily which was formed in 1806 when King Ferdinand V seceded from Spain and unified the states of southern Italy in an attempt to stop the religious unrest then taking place there. It is a constitutional Bourbon monarchy and a moderate One Truth Roman Catholic state. Naples is a world leader in geothermal power technology and its power stations on Mounts Vesuvius and Etna provide energy to the kingdom and neighbouring countries. As well as its Italian lands, Naples also has its North Africa colony of Tarabulus. Originally the heart of the Portuguese Empire, with the bloody Revolution of 1970 it was taken over by its former colony of Braseal, which had become the centre of that Empire in terms of size, population and productivity. Now it is considered to be the second most important region of the Empire, after Braseal itself, and is ruled by the highest-ranking noble of the Empire after the Emperor Alphonso I himself. Portugal is a hotbed of activity among the banned pro-Portugal political movements in the Empire of Braseal who want a return to its old state, in which the Empire was run by and for Portugal rather than Braseal. Because of this Portugal is a particularly authoritarian region of the Empire, and is very much a police state. The damage caused to the country during the Long War has only added to the perceived need for strict controls on the Portuguese people. Another effect of this is that Portugal has a large number of military bases and personnel stationed there, although with the end of the Long War the numbers of these are being gradually reduced. The most powerful of the Freethinker nations, Prussia consists of all of the North German region as well as the former Netherlands. Ruled by the Hohenzollern monarchy from its capital of Berlin, Prussia is a constitutional monarchy, and has been since the coup of 1894 when Prince William overthrew his father, King William II, and established a new government with limited democracy and religious freedoms. 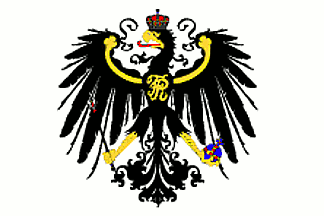 His father, the last Prussian absolute monarch, was the second of the extremist Prussian part of the Freidenker [Freethinker] movement who had made Prussia into something resembling an atheistic One Truth state. Prussia has remained fairly prosperous by being neutral in the Long War, although happy to talk and sell to anyone. A second-rank industrial and military power, the Kingdom of Prussia has a small colonial empire consisting of territory taken from the Dutch. This is made up of Suriname in South America and the Dutch Caribbean islands. The Prussian Netherlands suffer anti-Prussian terrorism from what become known as Orangeman terrorist groups. These have significant covert funding from the Dutch-descended nations around the world. 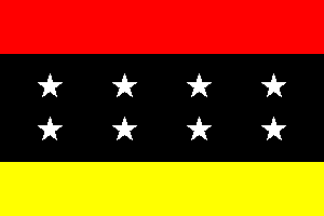 The flag of Prussia is the traditional Prussian design of a black eagle on a white background. An alliance formed in 1834 as a defensive pact against the Holy Russian Empire, the Pact was originally formed by the governments of Poland, Austria, Bohemia, Bulgaria, Serbia, the Ukraine and Romania-Moldova, and has its headquarters in the Serbian capital city of Sarajevo from which it takes its name. Bulgaria left the Pact in 1839 when it was taken over by pro-Russian forces and became a Russian satellite state. The Ottoman Empire joined the Pact as an associate member in 1847, as did the Persian Empire in 1850, although this was obliged to leave the Pact by the Holy Russian Empire in 1883. The militaries of the seven surviving original states were unified in 1842, and those of the associate members also have close links to those of the Pact. Because Pact assistance in preventing the Russian takeover of Bulgaria was thwarted by its being a purely internal affair, the Pact members have given the Pact permission to interfere in their internal affairs in situations where a state is endangered. This is especially the case since 1968 when the states making up the Sarajevo Pact decided, under the pressure of the Long War, to merge into a single unified government, also based in Sarajevo. Since the end of the Long War there have been calls for this merger to be undone, but so far there is no sign of this occurring. Taken as a whole the Sarajevo Pact is the largest state in Europe (not counting the Holy Russian Empire), and the largest industrial power (again excluding the Holy Russian Empire). However, when the Empires of France and England-Denmark are taken into account they are not the most powerful nation overall. Several of the great universities of the world are to be found in the Sarajevo Pact, in particular at Vienna, Prague and Krakow. The Sarajevo Pact as a whole has leased part of the surface of the Moon from the Mughal Empire and Dakshina Nad. The currency of the Sarajevo Pact was unified in 1850, and consists of the Mark, which is divided into sixteen Schilling each of which are divided into sixteen Bracteates. AUSTRIA. A founding member of the Sarajevo Pact, Austria is a multi-ethnic state formed from the dissolution of the Holy Roman Empire in 1817 and much reduced from its former extent by the secession of the regions that now form the nations of Bohemia and Romania-Moldova. Austria is a democratic republic with a government based on a combination of the Polish and French systems. It is also is a federation of several peoples, with a large minority Orthodox Christian population from many of the different branches of the Orthodox faith. It has large Slav, Romanian and Hungarian minorities. Because of it being such a culturally mixed nation, the politics of Austria tend to be quite unstable, with alliances and governments changing frequently, quickly, and, often, without warning. This political instability has hindered the development of Austria as a nation, and means that its military and economy are generally considered the weakest of the nations of the Sarajevo Pact. The head of state of Austria is the monarch, who is of the House of Habsburg. The capital of Austria is the city of Vienna. THE KINGDOM OF BOHEMIA. A founding member of the Sarajevo Pact, Bohemia has been a constitutional monarchy along Polish lines since it seceded from the Holy Roman Empire in 1801. Its capital is the city of Prague. Despite its relatively small size, Bohemia is the most scientifically and technologically advanced of the states of the Sarajevo Pact, with many foreign students at its universities, particularly those in its capital city of Prague. THE RZECZPOSPOLITA OF POLAND. A founding member of the Sarajevo Pact, the Rzeczpospolita (Republic) of Poland is a highly militarised state on the border of the Holy Russian Empire, Poland is a representative democracy, and has been since the eighteenth century, when the very different events in this world allowed it to remain strong and avoid being partitioned. Its militarisation stems from its position on the front line of numerous confrontations with the Holy Russian Empire. Because of this it is a founding member of the Sarajevo Pact, and also has close ties to the Mughal Empire and Ling China. All Polish citizens of both sexes perform national service when they reach adulthood, and all are subject to annual exercises and training. The Polish population is one of the most highly armed in the world, and Polish weapons systems are among the more widely used in the world. Poland is actually the Sixth Republic, a result of various wars and constitutional crises down the years. However, it is also a Kingdom, with an elected figurehead monarch. The Polish head of state is the Naczelnik Panstwa [Polish for 'Leader of the State']. Before 1825 the nation was known as the Polish-Lithuanian Republic, but having lost much territory, including all of Lithuania itself, to the Holy Russian Empire in the Second War of Reclamation, in that year the government finally admitted that it had lost Lithuania for the foreseeable future and the name of the country was altered to reflect this. Poland was the first nation on Earth to emancipate its Jewish population, in 1821, in keeping with its long history of tolerance for the Jews. Since then the Jews of Poland have contributed greatly to the success of Poland as a nation, and are to be found at all levels of Polish society and government. 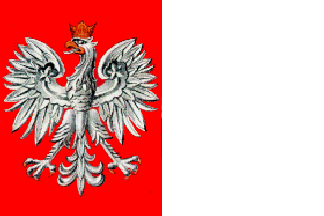 The flag of Poland consists of a rectangle divided into two vertical stripes, red at the hoist and white at the fly. A crowned white eagle design is centred on the red half. ROMANIA-MOLDOVA. A founding member of the Sarajevo Pact, it formed in 1833 from the merging of the Principality of Moldavia and Romania for their mutual defence against the Holy Russian Empire. The Romania-Moldavan head of state is the Domnitor, a hereditary position. Under him the country is ruled by the Veche, the national parliament, made up of the notables of the nation. The military is led by the Voivode. Although not bordering the Holy Russian Empire, it long border with the Russian satellite state of Bulgaria means that it is heavily militarised and heavily industrialised with a largely military government under the Domnitor. National service is compulsory for all citizens, and the country is run as a strict police state. THE KINGDOM OF SERBIA. A founding member of the Sarajevo Pact, its capital city of the same name was the site of the negotiations and signing of the treaty that created the Pact in 1834, and since then has been home to its headquarters. Serbia is officially Orthodox Christian, with its national Serbian Orthodox Church. Because of its origins as a region of the Ottoman Empire the country is culturally and religiously very diverse. However, because of political events in the region and the Long War in particular all of the peoples of Serbia get on very well and as such Serbia is one of the more tolerant of the European nations. The current Serbian head of state is King Stefan X of the Nemanjic dynasty. THE KINGDOM OF SWEDEN. A founding member of the Sarajevo Pact, Sweden is an efficient militarised autocracy, and has been since the coup that put King Gustav III on the throne in 1840. It has been forced to continue its militarization due to its position between the Holy Russian Empire and Anglo-Danish Empire. Since the accession Gustav III Sweden has been ruled by a dictatorial monarch, all of whom have managed to walk a fine line between benevolence and malevolence. Sweden is one of the few monarchies in the world where the successor to the throne is chosen not by blood but by adoption of the most suitable candidate by the current monarch, in a Roman-inspired system. This system seems to work well for Sweden, and because of it Sweden has had a succession of fairly competent rulers who have led the nation reasonably well. As a side effect of the competition involved in the adoptive succession system, the Swedish nobility have, over the years, been forced to become, and remain, largely educated and competent as well. All Swedes undertake national service at the age of eighteen, with periodic re-training. The Swedish military also patrols the Baltic Sea, particularly with submarines. Sweden has problems with pro-Anglo-Danish Empire terrorism in the parts of its territory which were formerly part of Anglo-Danish Norway, and which it conquered during the Long War. In addition to this there are also problems with Norwegian independence movements, which have also spread into the Anglo-Danish parts of Norway. These two groups fight one another as much as they do the Swedish government. The capital of Sweden is the city of Stockholm, as in the real world. The flag of Sweden is the same as that of Sweden in the real world. THE UKRAINE. A founding member of the Sarajevo Pact, the Ukraine is a small state on the border of the Holy Russian Empire [much smaller than the Ukraine of the real world]. Cossacks form a significant percentage of the Ukrainian population, and it is for this reason that the leader of the Ukraine is known as the Hetman. The Hetman is appointed from among the Ukrainian people by the members of the Ukrainian Assembly, the national parliament, after which they serve for life (although they can be removed from their position under extreme circumstances). They have executive powers and in time of war the Hetman is supreme commander in the field. The Ukraine is a heavily militarised, heavily industrialised state which has, over the course of the long war evolved into a fairly strict, if also fairly fair police state for its own protection. As part of this compulsory national service applies to all citizens. With the end of the Long War and the receding of the threat of Russia, calls for its liberalisation are becoming more widespread. The Kingdom of Scotland covers the northern tip of the British Isles. It has been ruled by monarchs of the Stuart Dynasty since Scotland split from England at the end of the War of the English Succession in 1744. Scotland is a small and relatively poor nation, particularly since losing most of the North Sea oil fields to the Anglo-Danish Empire in 1953, but has been supported by France against England and the Anglo-Danish Empire many times down the years. With the Kingdom of Scotland independent of England, there were no Highland and Lowland Clearances. Because of this, Scottish demographics are dramatically different to those of to the real world, with less emigration, and a continuation of the Clan-based social system in many parts of the country. Even without the Clearances, Scottish agriculture has had to dramatically change and improve over the years to support a population considerably higher than that of Scotland in the real world. The capital of Scotland is the city of Dunedin [Edinburgh]. Dunedin in this world is utterly different to that of the real world. With Scotland returning to being an independent nation, as well as the generally different history of the nation, it does not have the New Town and Neoclassical architecture of the real world. However, with the mixture of peoples living there it was still a great centre of intellectual activity in the eighteenth century, and this shows in the look and layout of the city. The second city of the Kingdom of Scotland, and its industrial centre, is Glaschu [Glasgow]. The centre of the Scottish government is Dunedin Castle, from where the monarch, currently Queen Mary IV, rules. Under her are the separate Privy Council of Scotland and the Council of the Clans, although the definition of precisely what is a clan has been expanded somewhat over time. The head of the Scottish government is known as the First Minister. Although the First Minister leads the Privy Council and the government, they are much less an absolute head of the government than the British Prime Minister of the real world. This is because the Stuart monarchs of Scotland (and previously England) have retained knowledge and interest in the details of their government, so that they retain considerable governmental power. Helped by the French, Scotland has acquired a small colonial empire around the world, with its holdings of New Shetland [Kerguelen], New Fife [in South America], New Argyll [in Marege Australia], Scotia Australis [the south island of New Zealand] and Nova Tiree [in Antarctica]. This colonial empire is mainly for prestige purposes rather than for any more practical reason. Scotland has a diverse culture with, in addition to the original Scots, elements derived from the English refugees who moved there after the War of the English Succession (many of whom brought their money with them and so helped to provide the new Kingdom of Scotland with a strong economic foundation), French elements from Scotland's traditionally close ties to France, as well as Welsh and Irish who moved there to escape English oppression, and a number of Dutch who immigrated after the takeover of the Netherlands by Prussia in 1864. A number of Scots who made their fortunes in India and who returned to Scotland to retire also helped to fund the new nation in its early days. Because of the refugees it took in at the end of the War of the English Succession and those who have followed them over the years, Scotland has a long tradition of religious tolerance that it maintains to this day, and was one of the first nations, and the first European nation, to enshrine full religious freedom in law, in 1750. Despite this Scotland maintains an infamous political prison for political dissenters on the Bass Rock. Scotland is well-known for its scientists, engineers and fierce mercenary soldiers, all of whom can be found working across the globe, in particular throughout the French empire and in Canada-Louisiana. The reputation of Scots mercenaries is helped by the national service that all Scots undertake when they reach adulthood. Scottish bankers are also a significant source of income for the nation, and have been since the secession of Scotland from England, and particularly since the takeover of the Netherlands by Prussia in 1864. The Anglo-Scottish border is a no-mans land stretching from the Irish Sea to the North Sea, fortified and guarded along its entire length by the forces of the both Scotland and the Anglo-Danish Empire. There have been rumours over the years of Scots funding pro-Stuart political/terrorist groups in England. Scotland uses the old English currency system of Pounds, Shillings and Pence. Its primary language is Scots Gaelic, with French as a second language and English a third. Scots Gaelic has significant French and English loan words and ideas. Scots English has absorbed some Danish influence from its proximity to England, but not as much as English English. There is also a significant Dutch-speaking minority in Scotland. It uses the Gregorian calendar, which it adopted in 1745. 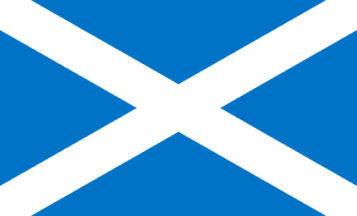 The flag of Scotland is the traditional white cross of St Andrew on a blue background. A democratic constitutional monarchy run along similar lines to the Estates-Universel in France, with a figurehead monarch of the Restored Bourbon dynasty as head of state. Spain as it now stands was formed after the Spanish Civil War, which ended in 1835. Its democratic system was put in place as it was seen as the best hope for avoiding another civil war. The Spanish Inquisition was abolished at the same time for similar reasons. Although almost exclusively a Catholic nation, and thus considered to be a part of the One Truth bloc, the long-standing historical links between France and Spain mean that Spain participated in the Long War on the side of the Dharmic Bloc. Spain is run by a bicameral parliament, the Cortes Generales, from the capital city of Madrid. Its currency is the Peso, which divides into eight Reales, each of which is divided into one hundred maravedíes. Spain has, and maintains control of, Gibraltar, which is re-took from the English in 1744. The flag of Spain consists of two horizontal red stripes separating a yellow stripe, much as in the real world, though without the Spanish coat of arms. A loose federation of largely independent small states (cantons) situated in the Alps, between Bavaria, France, Milan and Austria. Switzerland is dominated by the Protestant states within it, but is, as a whole, religiously tolerant. Switzerland has been able to remain independent thanks to a number of reforms forced through by a coalition of its protestant cantons in the early nineteenth century, which introduced a confederacy-wide administration, a modern bureaucracy and a unified foreign policy, all under a democratic Council of Representatives from all of the Swiss cantons which meets in the capital city of Zurich. However, at the level of individual cantons and the laws which govern most of the Swiss citizenry most of Switzerland remains very conservative and absolutist. There is some industry and agriculture within Switzerland, but most of its foreign exchange comes from its extensive banking interests, known world-wide for their stability, privacy and protection of clients' assets and information. Other income is earned via the work of Swiss mercenary companies around the world. Switzerland has no common language. Instead French, German and Italian are spoken by the people of different cantons. The flag of Switzerland is the same as that used in the real world. A small state on the northern edge of the Adriatic Sea, the Republic of Venice is a weak nation that is a satellite of the Sarajevo Pact and depends on it for much of its trade. With the decline of power of Venice, the city of canals in the lagoon has been largely abandoned and left to decay, with the business of the city moving to the mainland city of Mestre, which is now the capital of Venice as a whole. The state of Venice is ruled by the Doge, as it has been for more than a thousand years. The city of Venice remains inhabited by those on the fringes of society, making it a hive of vice, smuggling, espionage and other illegal activities. Given how lucrative some of these activities are it is rumoured that the Venetian government is effectively run by the criminals that operate there, with the Doge a mere front for them. Certainly the officials of Venice are well known as the most corrupt in Europe. The other nations of Europe periodically do what they can to reform Venice, but so far the Venetians have managed to sidestep most of these attempts, and avoid any military action against them intended to forcibly reform their country. 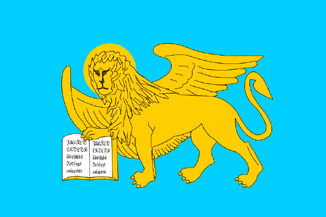 The flag of Venice is a light blue field on which is a winged lion of St Mark facing the hoist. With its right paw the lion supports an open golden book, on the open pages of which is written "Pax tibi Marce evangelista meus" ("Peace unto thee, Mark, my evangelist"). Go to the Gurkani Âlam Timeline, Differences, Politics, Science and Technology, Society, Notes or Summary Pages. Back to the Gurkani Âlam Home Page. Copyright © Tony Jones, 2007.